First of all, these screens are meant to be installed on a smooth interior trailer wall, because of the way the strap loops have to be installed with screws. NEW SCREENS: You will need to measure the height & width of the opening of the window, from the INSIDE. This will be where the screen portion will be placed, for maximum ventilation. The 3 strap loops (6 total ) can be installed on the top & bottom or the sides, HOWEVER, from the measurements you give us, each NEW SCREEN will be made larger (with a nylon frame all the way around) by 1 ½ inches on all sides. Take into consideration where the divider, tie loops, or slant wall may be. The position of the strap loops can be different for each window, depending on where you have room to install them. Keep your notes. When you receive your new screens, tape them up with masking tape & install the strap loops right next to the edge of the screens where the straps are located. The screens are designed to be tight, so they won’t flap & the horse can’t mess with them. The Velcro straps fasten to themselves on the outside of the screen, so the horse has nothing to mess with. 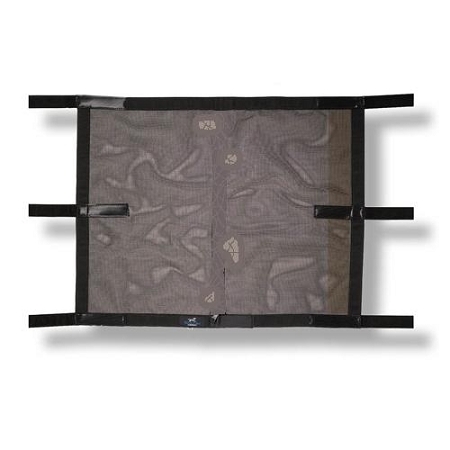 REPLACEMENT SCREENS: You will order replacement screens if you already have the 6 strap loops installed on the smooth inside wall of your trailer, 3 to a side or 3 each on the top & bottom. These screens will NOT be enlarged, so we want the exact measurement of the existing screens. There can be 2 issues here, where the screens were not installed correctly or not ordered correctly. They are not correct if the strap loops are not touching the screen edge, OR if the screen is loose & flaps loosely in the wind. The best thing to do here is remove the strap loops, install a small screw into the holes & reposition them. Or, start over & order larger screens that will fit the existing strap loop positions. The replacement screen measurement process is a little tricky! If the strap loops are on the sides: The height of the screen is taken from the strap loops on the sides. Measure from the top of the flat area on the top strap loop to the bottom of the flat area of the strap loop on the bottom. For the width, measure from side to side, just inside the strap loops, with the tape pulled tight. If the strap loops are on the top & bottom: the height of the screen is measured from just under the top loop to just above the bottom loop, with the tape pulled tight. The width is taken from the top or bottom row of strap loops. Measure from the outside edge of the flat area on the left strap loop to the flat outside edge of the strap loop on the right.